CMR College of Engineering & Technology, Hyderabad has advertised in DECCAN CHRONICLE newspaper for the recruitment of Teaching Faculty- Professor / Associate Professor / Assistant Professor Plus Non-Faculty jobs vacancies. Interested and eligible job aspirants are requested to walk-in on 24th June 2018. Check out further more details below. About College: CMR College of Engineering & Technology (CMRCET for short) is sponsored by MGR Educational Society, which was established in 2002. The College is situated 20 Km away from Secunderabad Railway Station on Hyderabad - Nagpur National Highway (Medchal Road), Telangana, India. The college is located in 10 acres of serene environment which is lush green and free of pollution. How to Apply: Interested and eligible candidates are requested to attend the Walk-in interview along with CV, all originals & one set of copies of certificates and recent passport size photos to the walk-in address given below. Professors can contact directly or send resume to the email address given below. 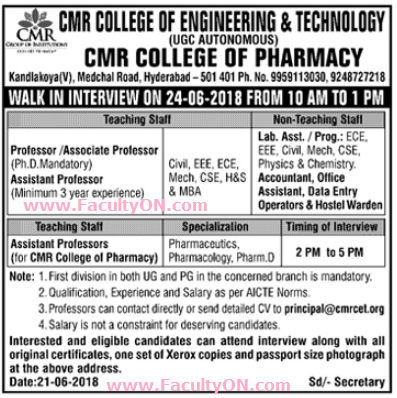 Reference: Advertisement from CMR College of Engineering & Technology, Hyderabad on DECCAN CHRONICLE newspaper dated 21st June 2018 for the recruitment of vacancy position such as Professor Associate Professor / Assistant Professor and non-teaching faculty jobs. See the copy of advt below.